This story is part of a series of reports from the ongoing POWER Study, which is developing cost-effective and scalable models for PrEP delivery in Kenya and South Africa. AVAC and the University of Washington (UW) have teamed up to help answer questions from implementers rolling out PrEP in a variety of settings. Using qualitative stories from the UW PrEP projects, these blogs share lessons learned from the field and actionable insights for implementers developing strategies for delivering PrEP. It started ten years ago, when Odondi turned to a local radio station in Kisumu to get out messages about PrEP. The idea was to inform the community about research going on in their backyard on a new HIV prevention intervention, PrEP, and enroll people in the study, known as Partners PrEP, which also sponsored the show. Since that launch, the show was popular enough to continue through the open label extension study, demonstration study, and scale up program that is part of national roll out. At the time, Odondi was part of the Partner’s PrEP team in Kisumu. It was a phase III placebo-controlled trial of daily oral TDF or TDF/FTC as PrEP for the prevention of HIV among heterosexual men and women in sero-discordant partnerships in Kenya and Uganda. Odondi saw that the providers and the scientists had developed a strong program to explain the study and how PrEP works. But that wasn’t enough. Odondi started at two Luo speaking stations with hour-long shows where he would talk about PrEP, how it worked and who it was for. He talked about knowing your status and connecting with services. He confronted myths about the research process. He talked about why young people are vulnerable to HIV exposure. He talked about condom use, abstinence, voluntary medical male circumcision, morality and public health, and the importance of protecting young people as an investment in the future. Ten years later, Odondi is the Community Liaison Officer for the POWER study (Prevention Options for Women Evaluation Research) and the Lead Technical Advisor for Community Outreach for the Partners Scale-Up project operated out of KEMRI (Kenya Medical Research Institute). As part of his work on these projects, he has 18 shows a month on six different stations in three languages, Luo, English and Swahili, including stations in Nairobi that are heard across Kenya. Through all these stations his shows reach millions. Each show starts with a 20-minute discussion between him and a station host on a prepared subject, the rest of the hour they open the phone lines and answer questions. The phone lines routinely fill up and stay full through the hour. His prepared remarks come from material he gets from the community through a couple of channels: he holds weekend workshops where he provides HIV prevention information to young women and they write down questions for him; the stations give their listeners a phone line where their questions and concerns are recorded for Odondi to review in advance of a show; and he provides a help line number over the air and promises that someone is always available to answer. People call. A lot. Odondi is able to provide them with information about where to get PrEP in their area which has led to increased enrollments in both the POWER study and Partners Scale Up project. Odondi has authored this brief outline on the benefits of radio as a tool for community engagement, complete with highlights of commonly asked questions and topics he covers. 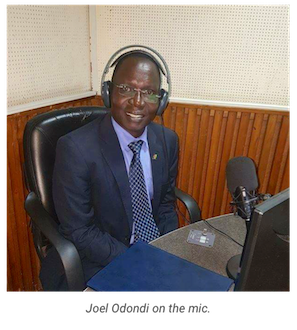 Hear Joel Odondi explaining PrEP on the radio airwaves of KBC English, a Kenya-based news service. POWER (Cooperative Agreement AID-OAA-A-15-00034) is made possible by the generous support of the American people through the President's Emergency Plan for AIDS Relief (PEPFAR) and the United States Agency for International Development (USAID). The contents do not necessarily reflect the view of USAID or the United States Government.